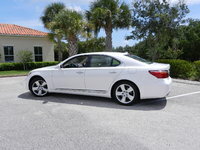 CarGurus has 1,816 nationwide LX 570 listings starting at $21,299. The 2011 Lexus LX 570 is a full-size SUV that tips the scales at nearly three tons, but provides enough power thanks to its 5.7-liter V8 engine that those looking for a luxurious ride can find it with an easy six-speed automatic and four-wheel-drive transmission available full-time. It's size and powerful engine don't make it easy on the wallet, with a 12/18 city/highway split for mileage, nor can one expect to get much further than 350 miles on a single 26.4-gallon tank of gas. Then again, buyers considering the 2011 Lexus LX 570 might not be too concerned about those issues. Instead, they might be more interested in the leather trim that adorns both the seats and interior features of the cabin, the extending seat cushions for front-row occupants, and even adjustable seats in the second row. Occupants in the middle row get to take advantage of the nine-speaker standard stereo system or the 19-speaker Mark Levinson system available as an option. They can even move their own seats for more comfort; the middle row offers a little more than 4 inches of travel. The driver can take advantage of the standard navigation system built into the center section of the dash to ensure minimal usage of maps, as well as the heated front seats. That feature is available as an option for the second row. For families, the optional 9-inch entertainment center could help out on longer journeys. While the 2011 Lexus LX 570 operates in the luxury segment, it is clearly modeled after a truck. Its body-on-frame chassis is softened somewhat by a specially adapted hydraulic system based on that of the Toyota 4Runner. Buyers shouldn't be shocked that this slightly tall vehicle can have issues at speed in turns, but it can also handle towing up to 8,500 pounds. Interestingly, a number of features that could benefit potential owners who never plan to take their LX 570 off-road were developed in extreme climates. The antilock brake system can adapt to multiple surfaces such as gravel and also improves performance in wet weather conditions. A hill-start system also prevents slippage on inclines. Like other luxury makes, Lexus has optioned the LX 570 with a "pre-collision system" that includes a number of safety features. Side impact and knee impact airbags for both front occupants come with this option, as do side impact airbags for the second row of occupants and side curtain airbags for the third row passengers. Occupants in the front row and the two outside seats of the second row also have seat belts that are pre-tensioned if the car's system detects a sudden drop in acceleration. 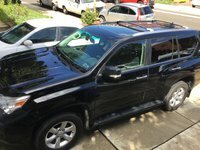 While the 2011 LX 570 can potentially seat up to eight people among its three rows, that's not recommended unless some of the occupants are children. Like most full-size SUVs, the third row can get a bit cramped, especially in terms of legroom. On the upside, all three seats in the middle row fold down separately, making accessing the entire interior fairly simple. The third row also folds down to increase storage space. What's your take on the 2011 Lexus LX 570? Have you driven a 2011 Lexus LX 570? 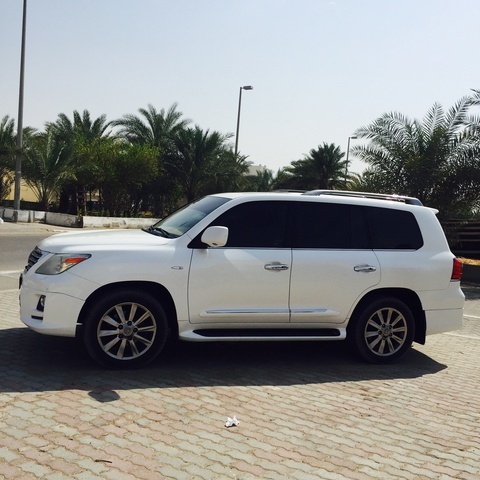 Do You Lexus LX570 2012?